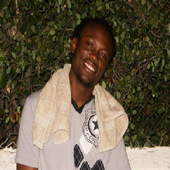 R. C. has shown Jamaica as a finalist on Magnum Kings & Queens of Dance hall, he is poised to be among the greats. Born on October 21, 1985, in a town with an unusual name, Gimme-me Bit, in the parish of Clarendon on that little island in the Caribbean called Jamaica, where many great Reggae crooners have distinguished themselves among the best in the world. “I love to hear singing,” says R. C. who fell in love with music from a tender age when he heard the sounds of R&B music on the radio. As early as age six, he can remember singing along; sometimes his mom would get mad at him for playing the radio too loud, but she wasn’t surprised by his love for singing because she told him, “from yuh born yuh bawl.” Not to mention he comes from a family of singers; a sister, an uncle and an aunt also sing, so singing is in his blood. During school years at Gimme-me Bit Primary and Kemps Hill High School, R.C. never showed his talent because he was extremely shy, but in 2002 at the age of 17 he decided that since he was getting older he had to be brave and overcome the shyness. He teamed up with deejay friend Brasco, they did collaborations until Brasco migrated in 2003 and R. C. began making his own music, writing his own lyrics and performing in his community. Originally, he’d taken the moniker Righteous Chant, but a friend made the observation that R. C. never sang dance hall or anything slack, so the friend suggested Righteous Child, which was shortened, although R. C. is also the initials of his given name Ryan Campbell. When Digicel Rising Stars debuted in 2004, R.C. went to one of the auditions; it was his first time in front of judges and facing Anthony Miller was the hardest thing he’d ever done, but the righteous one was far from discouraged. He worked hard, writing, singing and developing his craft, performing at a few stage shows in Clarendon, while working as a merchandiser at Excelsior Crackers and later with his dad. A few years later, 2007, another talent competition premiered; R. C. wasn’t sure whether or not to take it seriously, but when he saw that it was a serious show, he prepared to enter the second year. Magnum Kings & Queens of Dance hall 2009 was a good experience that has helped propel his career and showed him that he’s been doing everything right. For this Righteous Child, it is just the beginning, under the guidance of “my wonderful manager,” Umerah Mujahid, One House Entertainment, R.C. plans to continue creating really good music, to “help people through the music.” He enjoys making Lover’s Rock, cultural and reality songs, songs that people can relate to and love, because there are times when “you can’t relate to something in a song, but someone else can.” To him music is more than just a person singing, music is real. “Music is not about what you can get, but what ou can give. Music is Life. Music is Real,” he says. Copyright 2011 meggatron2000.co.uk. All Rights Reserved.